Last Spring, I joined a group of women in a workshop called, “BeingSelf Love.” My friend’s sister and her best friend wanted to lead a monthly class that discussed chakras, self care, and spirituality. We all read 7 books over the course of 7 months and got together each of these months. The theme of the class would be whichever chakra we were studying in that month, starting with the root chakra ascending to the crown chakra. The first half of the workshop each Sunday was a lesson and the second half was when we ‘processed’. It was definitely an “out there” kind of workshop for me to join – we meditated and dug very deep into the core of our feelings. During the process portion, we would talk out what was going on in the depths of our mind and it would become very emotional. Sometimes releasing all that energy is helpful, especially when you’re around supportive friends. I loved the workshop and I learned so much about myself. My favorite book we read was “Wheels of Life.” It had chapters on each of the 7 chakras and it was while I was reading this book that I started shifting my perspective on life. Being open-minded toward this new way of thinking was how I got to where I am now. I would still be stuck if it weren’t for these women, classes, and books. On our last class, we were asked to make a vision board for ourselves. It was such a perfect project for me to do because it forced me to think about how I want my life to play out. When was the last time you envisioned what you hope your life to be? I grew up thinking that by the time I’d turn 30, I’d be married and have a kid. Pretty standard for the American dream. And I’m nowhere close to it right now. But with this project, it showed me that there isn’t a timeline. I have a few key goals and am trusting that I will reach them at some point in my life, no number about it. Adventure, Love, and Family. So. Much. STUFF. So. Not. ME. Above my desk in my bedroom is my vision board. I typically get ready for work every morning at my desk, but I rarely take the time to look up at it and think about it. A few days before my Bali vacation, I took this picture. I finally did take a moment to look at it again and at the time, I felt that my “Wild at Heart” adventure was about to begin. I look at it now and I smile – it is beginning! I appreciate the vision board because envisioning how I hope my future to be, it’s been subconsciously on my mind. It seems so simple, but even those little photos are like seeds being planted in this blooming journey. Whether I notice it or not, my mind will have these goals as a focus and everything I do will be in the direction of these hopes and dreams. 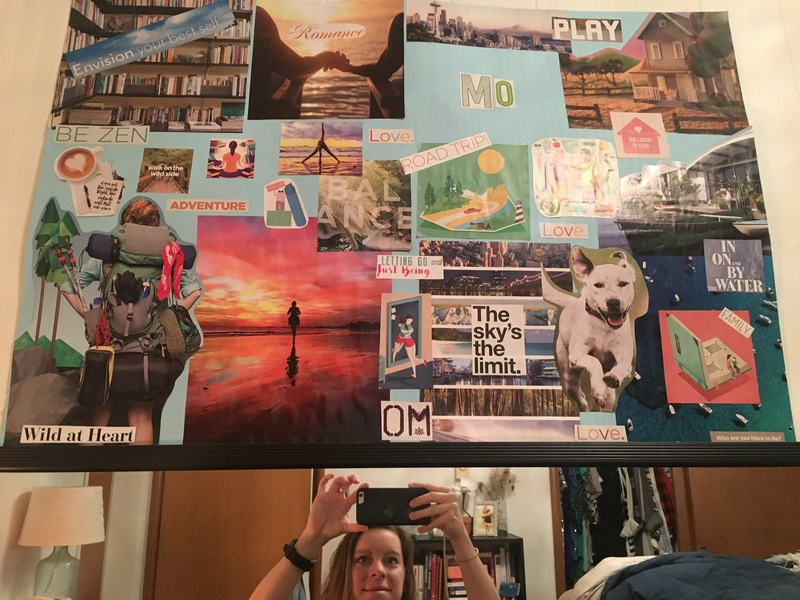 Who knew a DIY vision board could be so powerful? !